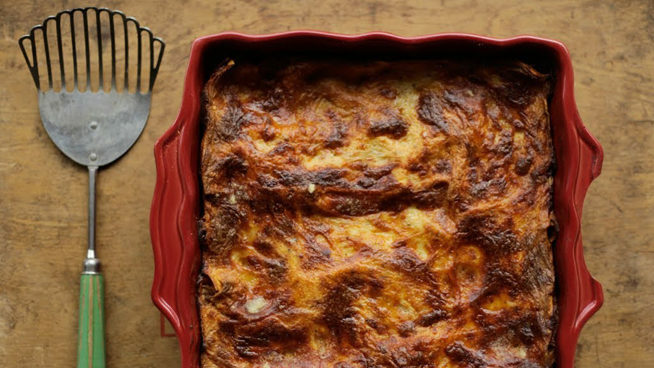 Our Classic Italian Lasagna would often take the place of a Sunday roast in our household. In the region where we’re from the pasta will be made fresh (either normal yellow fresh pasta or in Bologna they make their pasta green using spinach) – although you can also use pre-cooked pasta sheets from your local supermarket. For us, making a Lasagna was a ritual…our nonna would prepare the ragu and pasta on the Saturday and we remember going to bed as kids with the smells of the ragu simmering right through the house. Then on the Sunday morning us kids would help her layer it up. Yes it takes a little time to make with fresh pasta – but hey, so does a Sunday roast! HEAT a large pan over a medium heat. When hot, lower the heat and fry the pancetta for 2 to 3 minutes, until it starts to crisp up. STIR in the onion, carrot and celery and leave to sweat with the lid on for 10 minutes, until soft and translucent. Add the garlic to the pan and stir for 1 minute. ADD the beef to the pan, stirring occasionally until browned all over. Pour in the wine and keep stirring for 2 minutes. The aim is to burn off the alcohol, leaving just a hint of the lovely wine flavour. STIR in the tomato purée and chopped tomatoes and then add the beef broth and the bay leaf and stir together. Leave the ragù to simmer with the lid on for 15 minutes. Remove the lid and continue to simmer for a further 15 minutes. Season with salt and pepper (keep in mind that the Parmesan used in the lasagne is quite salty). PREHEAT the oven to 180 ̊C/350 ̊F/gas 4. BRING a large pan of salted water to the boil and blanch the pasta sheets for about 2-3 mins, until al dente. Lay them on a clean tea towel to absorb most of the water. Reheat the white sauce, loosening the sauce with a little milk, if needed. SPRINKLE with extra Parmesan and cook in the oven for 30 to 40 minutes until golden brown and bubbling. TIP: Leave to cool for 10 mins so that it is easier to serve up and it holds it shape.